I started out ready to conquer the day. To have my quiet time, get the kids fed, the house cleaned and grocery shopping done. But it's been a rough day. The kids started fighting over big brother's new birthday toys as soon as daddy walked out the door. I burned a waffle while trying to separate them and give little brother a different toy. I got everyone dressed, bag packed and shoes on to head out the door for our grocery trip. As I opened my planner, I realized I didn't do my meal plan and grocery list over the weekend because we were in birthday party mode for big brother and had family in town. So now, I have to hurriedly look through the fridge and pantry and make a quick meal plan and list while the toddler tries to climb up my leg. We get loaded up and head out to the grocery store. Except my low fuel light dings at me a mile down the road and I have to stop and get gas while the toddler screams in the backseat because he hates his car seat. Grocery shopping proves harder than usual. The big kid wants everything he sees "for my birthday" and the toddler starts screaming halfway through the store because he is cutting his last 4 teeth ALL AT THE SAME TIME before his last set of molars and is a whiny, crying, drooly mess. Everyone stares at my screaming child and we just buckle through and finish as fast as we can. In the check out line, we get our kid coupons for prize point tickets at the door. Which makes the toddler stop screaming but makes the big kid cry when the point machine isn't working and won't take their coupons. We have to leave ticket-less and tearful. The toddler screams all the way home in the backseat and we are almost rear ended by a delivery truck at a stop light. Mommy's nerves are officially fried. Said toddler then falls asleep from so much screaming as we turn into our neighborhood and acts like I am mudering him as I take him out of the car seat to go inside. All while our older neighbor across the street stops and watches with a sympathetic wave. I hand the toddler a banana and his water bottle when we get inside in hopes that he's just hangry and will stop screaming. Nope. Great. I throw the pizza in the oven that the big kid picked out for his birthday lunch as the toddler throws himself on the floor. Time for Tylenol. I stop and say a prayer for endurance and strength. This momma is frazzled and on the verge of tears. Pizza is done and kids eat. Toddler stops screaming and is semi-normal. Big kid eats more than normal without a fuss or reminders to keep eating and hugs me as a thank you for the birthday pizza. The toddler goes down for a nap without a fuss. My rough day started looking up. I stop and remember Romans 12:12 "Rejoice in our confident hope. Be patient in trouble, and keep on praying." I had a rough day. And I tried doing it on my own. I didn't start my day with a prayer. Mommy got up and got moving with her day. And it became a hot mess by 8am. How often do we rely on ourselves and then wonder why things are in such shambles? How long do we let ourselves get worked up and frazzled before we turn upward to refill our cup? I spent too long today wallowing in my situation wondering "Why me? Why today???" instead of turning to the One who could turn my day around. The day continued on and we definitely had our moments (like when dinner got postponed a little because little brother pulled and almost full bag of pretzels out of the pantry and dumped them on the kitchen floor. And then when mommy was cleaning up said mess, he proceeded to find big brother's unfinished snack of pretzels and dump them in front of the tv on the floor). But once I stopped my day and looked above, I could handle things better. I wasn't frazzled over little (and some more than little) things because I know God has a plan for me as a mother. And it's not being overwhelmed and frazzled at everything that doesn't go how I want it. So stop your day mommy when you start to get overwhelmed and look to the One who can turn your day around. I don't see you regretting it. 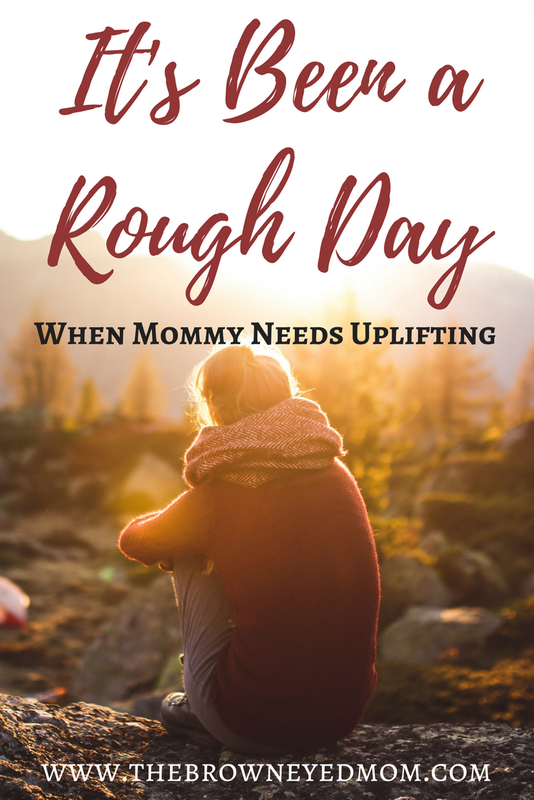 Are you letting Him be your rescuer on your bad days?